One dead father, One messed up family, One girl who just wants to help, One school bully who always gets his own way, One man of the church offering comfort, And one Hand puppet who is completely out of control – He’s shocking, dangerous and taking no prisoners. All hell is breaking out at the Vaudeville theatre as this hilarious and provocative new comedy lands direct from Broadway, where the New York Times hailed it “flat-out hilarious” and the New Yorker called it “Sesame Street meets The Exorcist”. 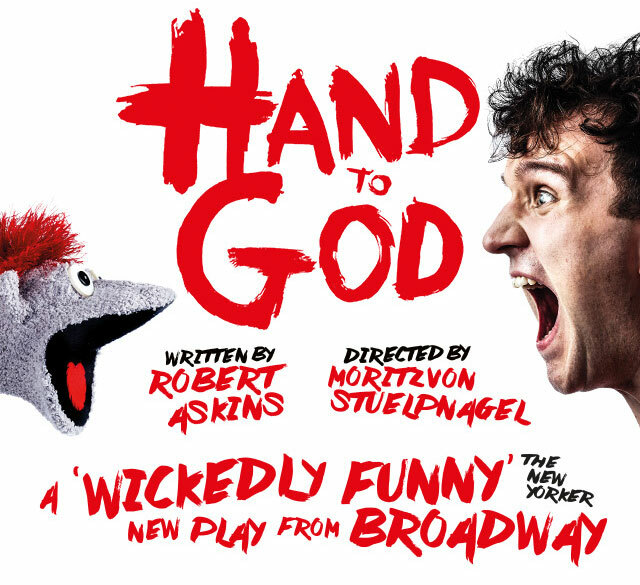 Last night I went to see Hand to God at the Vaudeville and oh my god did it have me in stitches. Literally all I knew was that it had puppets and the guy who played Dudley in Harry Potter in it but that was enough to sell me on it. I’ve previously seen Harry Melling in The Hot House and enjoyed his performance but taking centre stage as Jason/Tyrone he completely blew me away. Hi puppetry was on point and his ability to switch between the characters of Jason the boy and Tyrone the puppet was incredible to watch. In fact, this entire cast is one to be reckoned with and there was not a single performance that I felt was lacking or did not work within show. We’d scored £20 tickets via a deal with TimeOut London and were expecting to be up in the gods or at least at the very back of the stalls so imagine our surprise when we were directed to our seats in the second blooming row! The view was amazing (even more so after the two guys in front decided to move a couple of rows back after the second half) I loved being so close and able to see everything that was going on as on my last theatre trip to see Les Mis we were literally as far away as could be and it definitely impacted my enjoyment of the show. These seats meant that we could properly take in the set and it was a very clever use of the space indeed especially in the second half. The script is crude and rude so it won’t be for everyone and at times I did cringe to the point where I wanted to put my hands over my eyes in embarrassment. There are a couple or scenes which were obviously only inserted for shock value but as I’ve said before and I’ll say again, just because something isn’t a good topic doesn’t mean that the art itself isn’t good.